The next offering of the Master Pond Manager course will begin March 25, 2019. 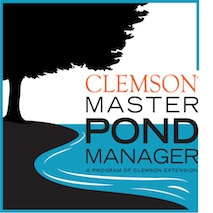 This Clemson Extension-sponsored program provides management strategies to stormwater and recreational pond owners and managers through an online classroom and hands-on field training. Participants can complete the full Master Pond Manager recognition training, or complete a Letter of Completion in Recreational or Stormwater Pond Management. Participants in the full Master Pond Manager course will receive three Category 5 pesticide CEC hours. The spring 2019 course will host field days in the Florence/Lake City area (Florence County). See the course syllabus for more information. All are invited to attend. Registration ends March 18th! Visit http://Clemson.edu/mpm for more information and to register. I think these are excellent courses and many students should try, it will give them a lot of experience that will help them in their future career. And if you need help in writing dissertations, then you can find a lot of useful information on dissertation writing service like this https://paperell.com/dissertation-writing-service , I think this will be important, because dissertation is quite a difficult task.